After a 5.6 jamming start, the flake offers sustained and fun liebacking. If led, the 3-4.5? cam placements are hard and awkward to see. 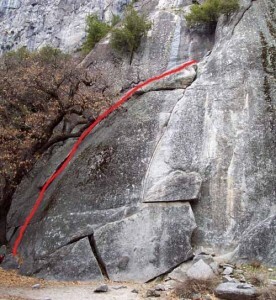 This climb is frequently soloed and is conducive to laps. When setting a toprope, use the bolt anchors, but bring slings and cams to set a directional. Which SuperTopo guidebooks include a topo for Oak Tree Flake?